Is the Obama Administration Forfeiting IAEA Inspections of Iranian Military Sites? The coming days represent a fateful stage in U.S.-led attempts to reach a diplomatic solution with Iran over its nuclear program, and disturbing signs are emerging that the Obama Administration is prepared to relinquish demands by the international community for Iranian transparency. Negotiators from the five permanent United Nations Security Council countries, plus Germany (known as the P5+1 countries) had hoped for a smooth final round of talks leading to a comprehensive agreement. Instead, they find themselves facing a firm Iranian refusal to allow international inspectors to visit military installations in Iran where suspected work had been carried out on a military nuclear weapons program. Iran is also refusing to back down from its refusal to allow the International Atomic Energy Agency (IAEA) to question Iranian nuclear scientists about possible military dimensions (PMD) of Iran's nuclear program. As crunch time looms ahead of the June 30 deadline, Iranian Supreme Leader Ayatollah Khamenei has clearly signaled that he will not budge on his refusal to let the IAEA gain access to suspicious sites and to key nuclear research personnel. If negotiators cave to these demands, the damage to global arms control efforts, and to international security as a whole, will be significant. "We will never yield to pressure ... We will not accept unreasonable demands ... Iran will not give access to its (nuclear) scientists. We will not allow the privacy of our nuclear scientists or any other important issue to be violated," Khamenei recently told Iranian state TV. "I will not let foreigners talk to our scientists and to interrogate our dear children ... who brought us this extensive (nuclear) knowledge," he said. Massoud Jazzayeri, deputy chief of staff of the Iranian Armed Forces, echoed the Supreme Leader's position, saying that that permission "will definitely never be issued for any kind of access to the military centers, even if it runs counter to the acceptance of the additional protocol (to the NPT) ... Foreigners' visits to defense and military centers as well as obtaining information about the related equipment and tactics are against the orders (of the commander-in-chief Ayatollah Seyed Ali Khamenei) and also the demands of the entire Iranian nation." "Everyone should know that in our view, visiting the military centers is completely impossible since it is among our redlines and we will not allow anyone to opine on such issues," the deputy Iranian chief of staff added. If the international community accepts Khamenei's stance, it means it will effectively force the IAEA to close the case on previous Iranian attempts to gain information on how to build a nuclear warhead. The signs from Washington indicate that the Obama administration may be prepared to acquiesce. "We're not fixated on Iran accounting for what they did at some point. We know what they did. We're concerned about going forward," Secretary of State John Kerry said in recent remarks, revealing just show just how far the administration is prepared to go to reach a deal. The State Department then tried to walk back Kerry's remarks, insisting that the U.S. has not shifted its stance and continues to demand that Iran addresses IAEA concerns. But these efforts to play down a shift in the White House's stance are not particularly convincing. Today, the New York Times reported on a letter sent to President Obama by five former advisers expressing their concern that administration concessions put it on a path toward a deal that "may fall short of meeting the administration's own standard of a 'good' agreement" and laying out a series of minimum requirements that Iran must agree to in coming days for them to support a final deal. Others who remain skeptical include the former director of the Defense Intelligence Agency, Lt. General (ret.) Michael T. Flynn, who on June 10 told the Joint House Foreign Affairs and Armed Services Subcommittees that the would-be agreement "suffers from severe deficiencies." The deficiencies, Flynn, said, included "the matter of incomplete verification. Iran's leaders made it clear the furthest they will go is to allow international inspectors (IAEA) only 'managed access' to nuclear facilities, and only with significant prior notification. This makes it nearly impossible, as a matter of full transparency, to have real 'eyes on' the state of Iranian nuclear development to include their missile program....Iran's nuclear program has significant – and not fully disclosed – military dimensions. The P5+1 dialogue with Iran has glossed over a number of such programs (including warhead miniaturization blueprints) in pursuit of an agreement." The former DIA director warned that "it is prudent to conclude that there are elements of Iran's nuclear program that still remain hidden from view... Giving Iran a pass on these issues would send a deeply troubling signal to the nuclear Non-Proliferations of Nuclear Weapons Treaty (NPT)." Such a willingness to forgo any semblance of Iranian transparency will surely set off alarm bells in Middle Eastern capitals threatened by Iran, from Jerusalem to Riyadh to Cairo. 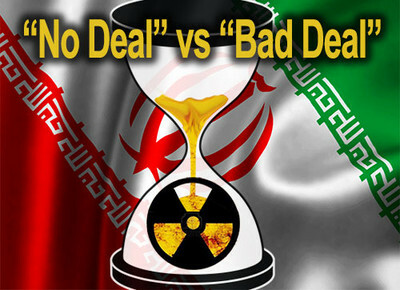 In fact, the European Union has reportedly indicated that it would reject any proposal for a deal that omits IAEA inspections of Iranian sites and the questioning of nuclear scientists. The EU has pressed Iran on the need to cooperate with IAEA monitoring. It publicly voiced its disappointment last year when an IAEA report said Tehran refused to answer questions about PMDs, and called on Iran to cooperate with the UN agency. Although the U.S. is by far the most influential member of the P5+1, and is the lead negotiator within the group, Washington would still require a consensus agreement from the other members in order to conclude any deal. In order to try to allay concerns, CIA Director John Brennan came to Israel this month with a message, saying that the IAEA's supervision would have been symbolic, and that monitoring by state intelligence agencies provides the real guarantee against future Iranian attempts to break out to the bomb, not IAEA inspections. According to a report by the Middle East Media Research Institute (MEMRI), Brennan had hoped to convince Israel – and through it, the EU – of the adequacy of intelligence monitoring for keeping tabs on Iran's nuclear program, and the lack of any real need for IAEA inspections at military sites. Whether or not that claim is true, it still fails to deal with the fallout such an arrangement would trigger in the region, with its casual abandonment of past breaches of the NPT, and the ease with which arms control enforcement is dropped. Such a development could easily be interpreted by Sunni Arab states, like Saudi Arabia and Egypt, as a green light to violate the NPT, too. These states and others, which are not very stable and face challenges from radical Islamists, could begin work on their own nuclear program, to provide a counter to their threatening Shi'ite rival. Should a nuclear arms race in the world's most unstable region break out, it would pose an enormous challenge to international security. It was supposed to be one of the things an agreement with Iran would avoid. impeach him.start a tweet and lets go!